On Saturday October 12, 2013, I went north from my home in Phoenix to the beautiful town of Sedona, Arizona in order to attend the Sedona Art Festival. 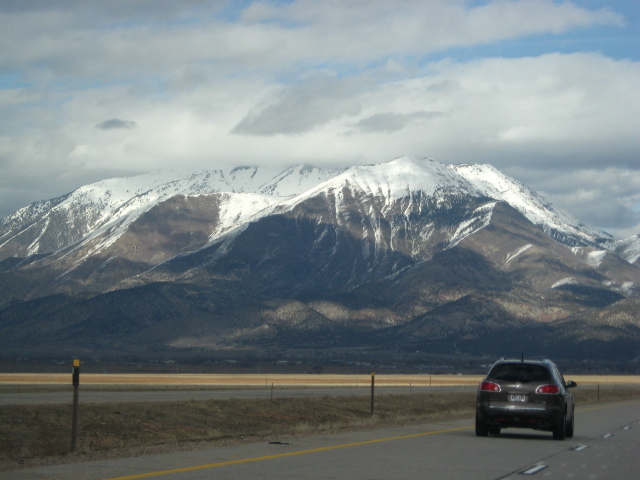 I am not that big an art aficionado–yes, I enjoy looking at art, and yes, I sometimes commission the creation of fantasy art for Tunnels and Trolls products, but ordinarily, I would not drive more than 100 miles to spend money to look at expensive art. 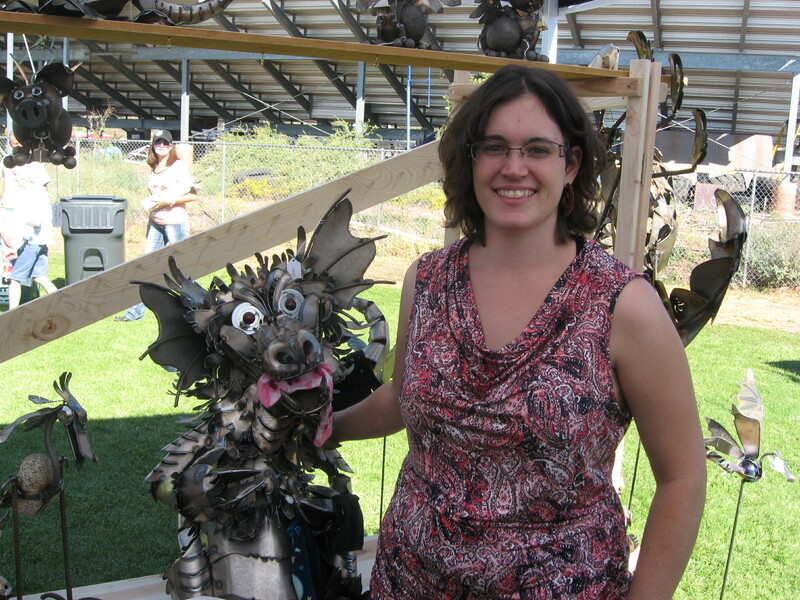 I did it this time because my niece, Angela St. Andre, brought her metal sculptures down from Salt Lake City, Utah, to exhibit and try to sell them here. St. Andre women lost in a forest of metallic creatures. Much of the Arizona St. Andre family came out to see her. My brother, Brian, and his wife Donna went up. My sisters Julie and Neloa, and their husbands Jim and Jerome came by. My mother, Evelyn, came with Jim and Julie. My niece Kerina was there with her fiance Gary. My other niece, Kris and her children were present. I brought my son James along with me. It was quite a gathering of the clan. These people can all be seen on my Facebook page. Uncle Ken had 3 nieces there at one time, and I’m happy to say they are all beautiful and talented young ladies. But this blog is about Angela. 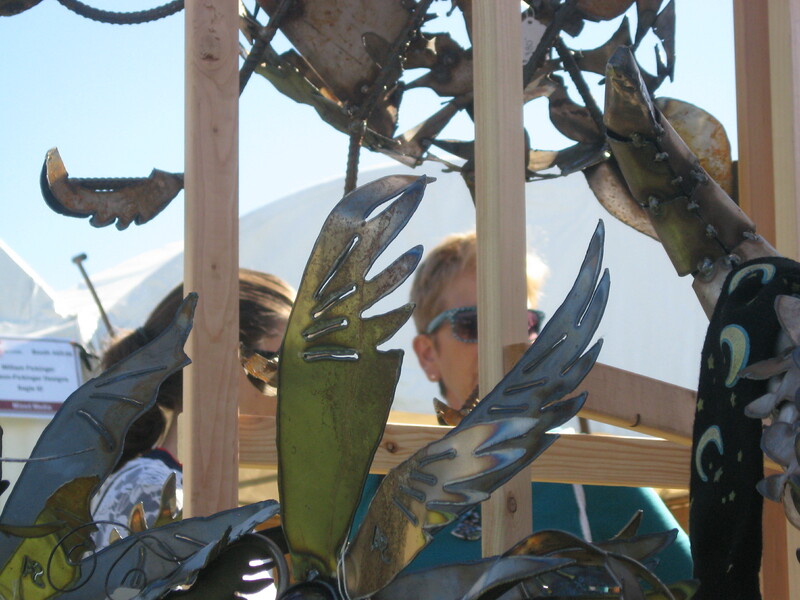 She has been perfecting her art as a metal sculptress for a decade now, and she is very good, and very innovative. She just got married to Joe Coleman, but he didn’t make the trip with her. She had to move all this metal herself. On the one hand, I’m sorry for her. On the other hand I admire her tremendously, not only because she’s an aritist, but also because she does what it takes to get her art out in front of the people. I took a couple of pictures of her with her biggest creations. Angela with sea serpent. This sculpture is 8 feet long, about 3 feet high, very curvy, and available for only $6000. Angela is very good with fantasy. All of her creations, robins, bears, flying pigs, horny toads, armadillos, sea serpents, wizards, and dragons have style. Angela St. Andre is a dragonfriend. This guy is one of the cutest dragon’s you’ll ever see., and he can be yours for a mere $2500. Saturday was a beautiful day in Sedona, and I was glad to be able to spend part of it hanging out with Angela, Mother of Dragons. 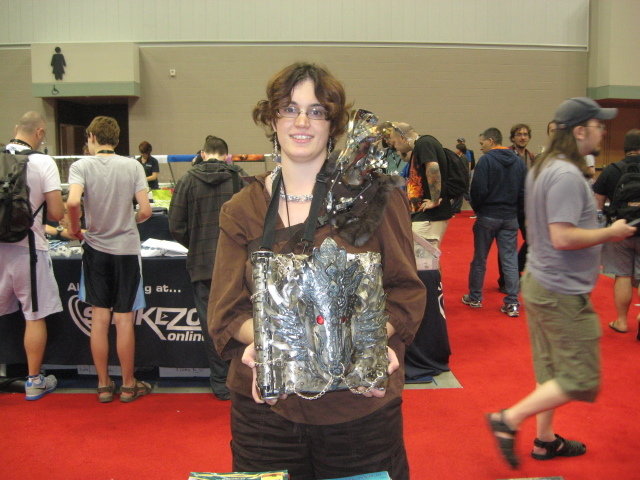 And here’s a shot of me with one of her smaller creations, the one I bought and took home with me. Actually, I didn’t spend the whole day with Angela or my family. I walked around and saw a lot of other really amazing art up there. I especially liked the painted wooden carvings and figurines from Oaxaca, Mexico. I took some pictures of other great art, too, but was having some trouble with the camera. Somehow it thinks all the pix have to have 1 or more megabytes of memory, and it is only a 15 mb camera. Gotta find out what’s wrong, and get the pix back down to a couple hundred kb before I go shooting things again. If you know any sculptors or sculptresses, or if you like metal art and have any, why not go ahead and leave a comment? 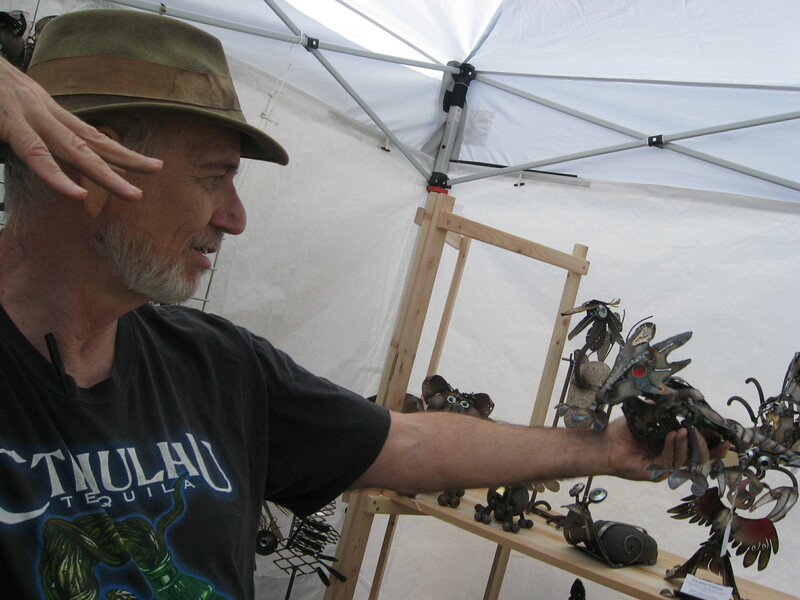 If you saw anything cool at the Sedona Art Festival, you might also leave a comment. 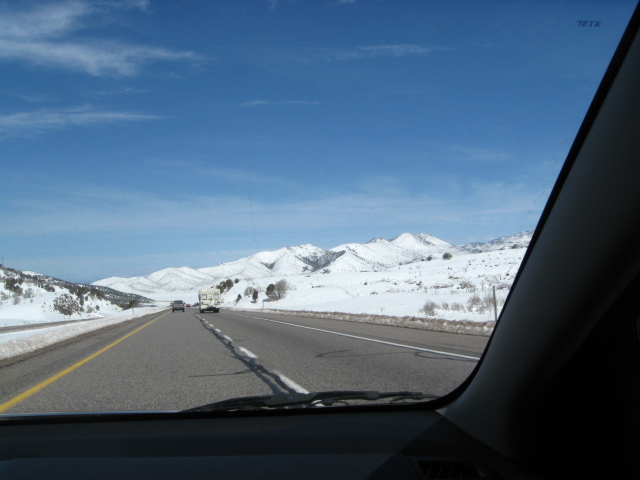 After a peaceful night in Las Vegas, James and I loaded the car, got onto I-15 and headed for Salt Lake City. 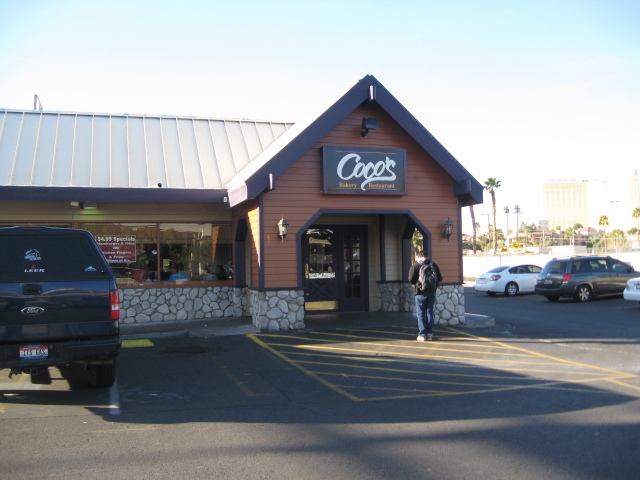 A hearty breakfast at the cafe right next to the Motel 6. How convenient is that? 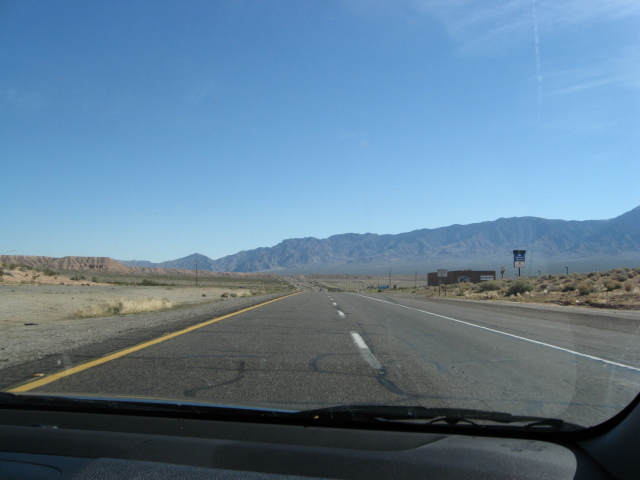 On I-15, heading northeast out of Vegas–it isn’t the most exciting terrain in the world–yet. 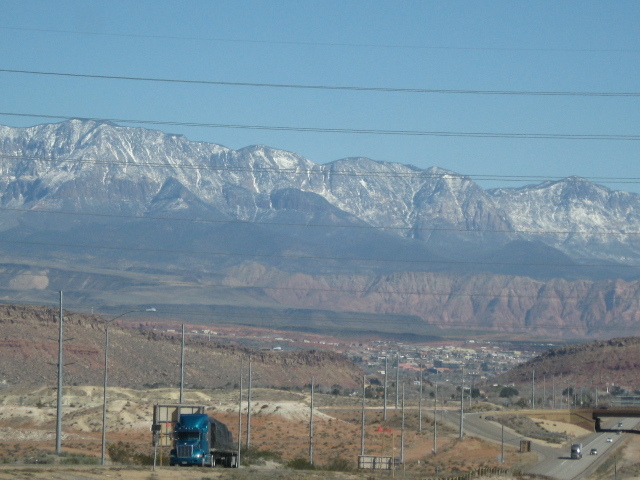 Entering Utah, rhe mountains start and snow appears in the distance. 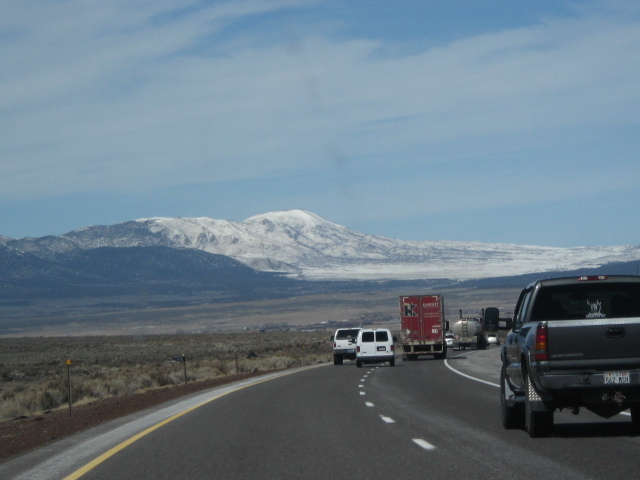 I thought we would be climbing that mountain I saw in the distance, but instead the road went down. 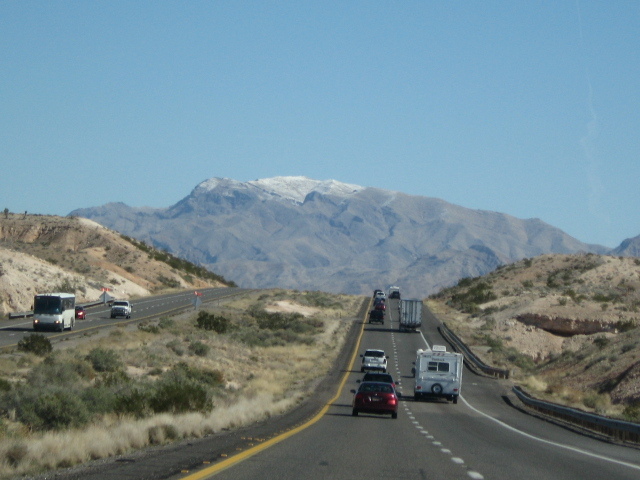 With one canyon behind us, even more snow appears in the distance. It may seem commonplace to most of you, but snow is a big deal to me. I just don’t ever get any in Phoenix. 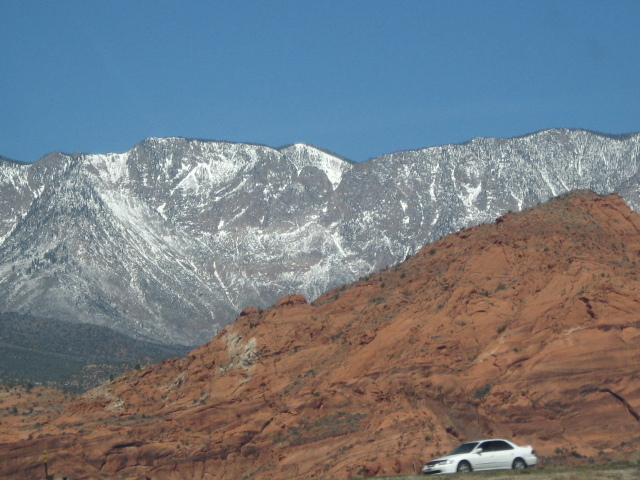 Mountains are never out of sight in Utah.
. . . and they just keep getting bigger. 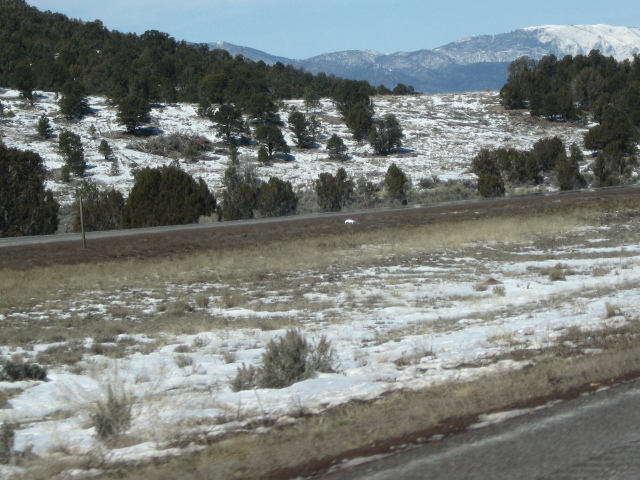 Snow on the ground just outside the car–not on distant mountains but all around us now! It’s a road trip. 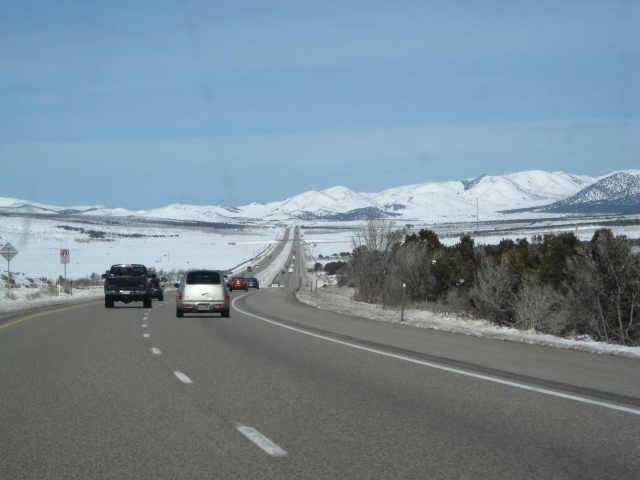 You’re going to see lots of pictures of the road. I love this part. Just sailing along through unfamiliar territory, watching the landscape unfold in front of me. Stretching my legs. 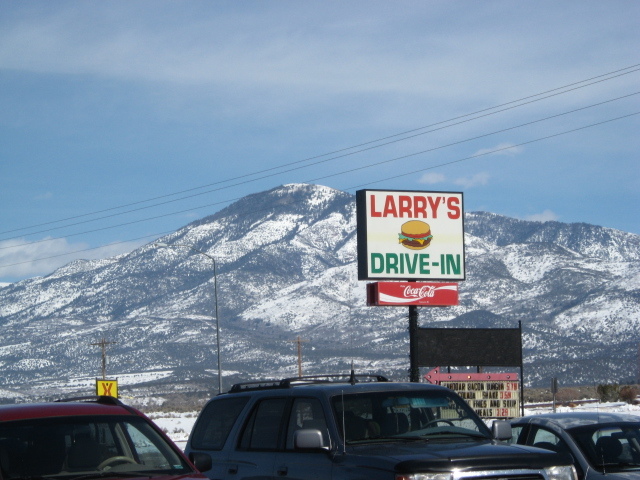 Larry did not get my business–I didn’t see his place in time. I guess location really is everything. 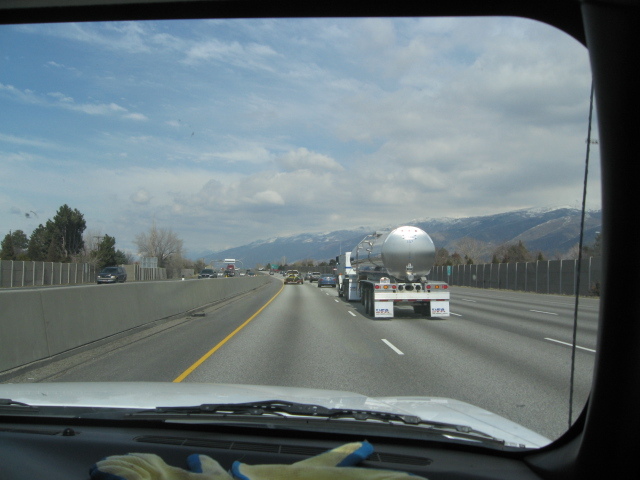 Salt Lake City, here we come, but first we have to get past Mona. Woo hoo! We have arrived at Henry’s house, only getting lost in the suburbs once. 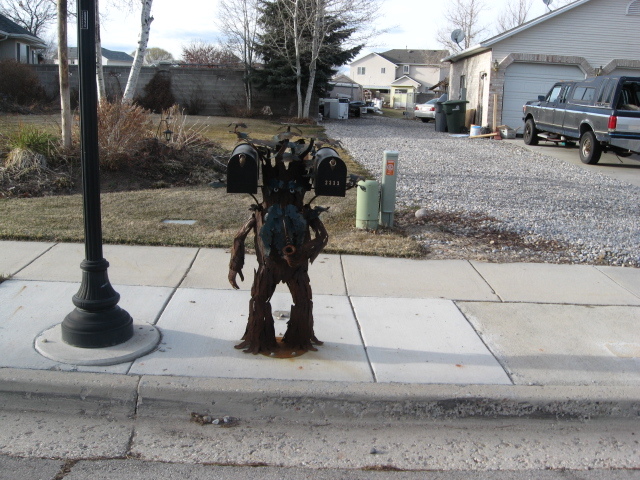 This hardworking Entish mailbox is the work of my niece Angela St. Andre, and is the coolest mailbox post in the state of Utah, imho. 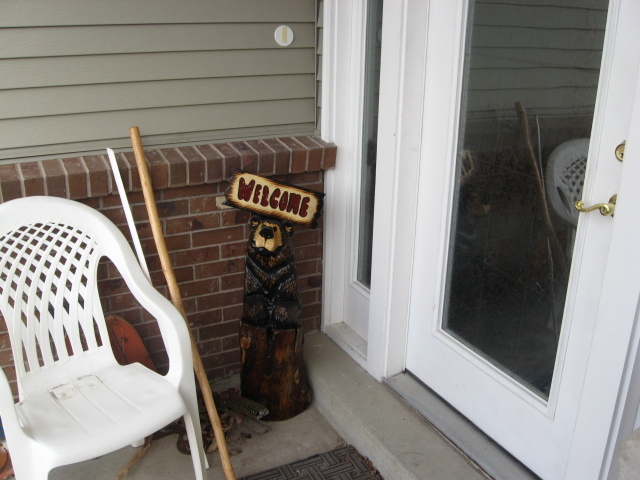 A bear welcomes us to Henry’s front door. 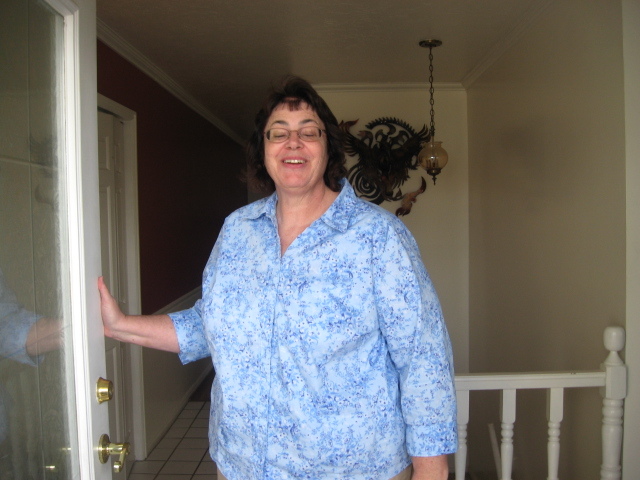 Gail St. Andre welcomes us to her home. The fact that we could stay with family really made the trip worth while . . . and saved money on hotel bills. Eep! The bear is friendly, but I don’t know about the giant spider. Henry St. Andre, the youngest of my 3 brothers, shows off an elk-skin cap that he made for himself. 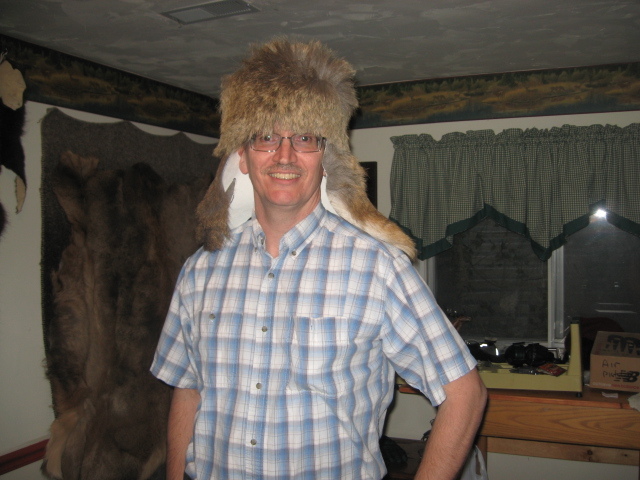 The spirit of the American frontier is still alive in this household. Henry is a farmboy at heart. 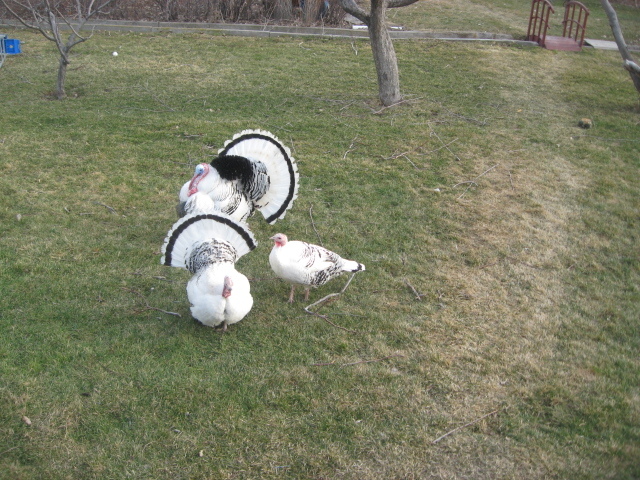 He keeps turkeys in his huge back yard, and chickens, and two cats. We arrived on Monday night. 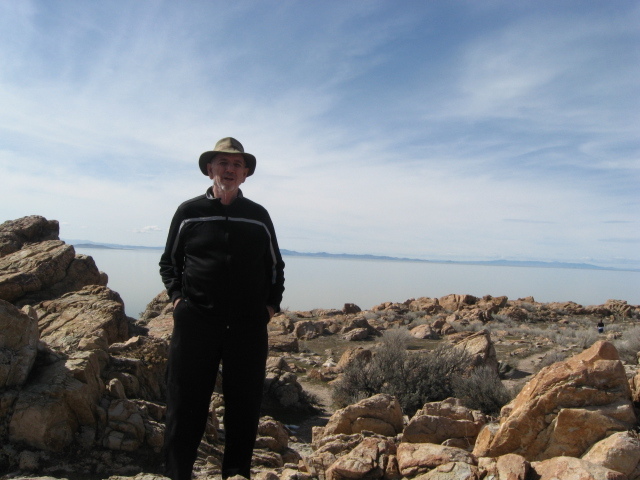 On Tuesday, Henry took James and me to Antelope Island in the Great Salt Lake. This is just the freeway heading into the city proper. 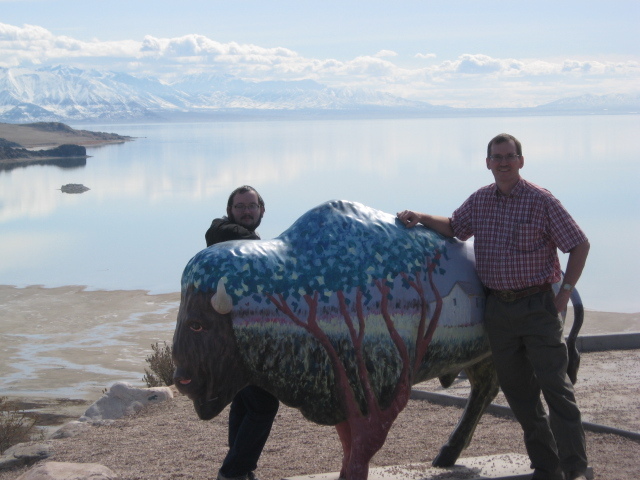 Henry and James are posing with a patriotic and very colorful buffalo on the island. 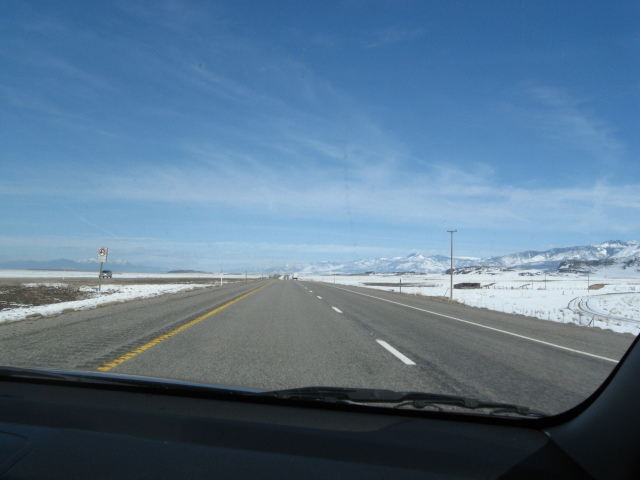 You can see part of the Great Salt Lake behind them. 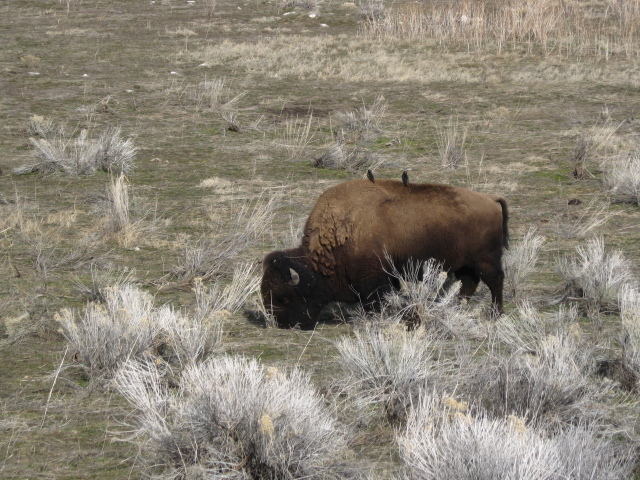 We climbed a very steep hill to get a better view, carefully stepping over the trail markers left behind by the real buffalo on the island. Another view of the lake. The brown stuff in the foreground is a kind of scummy algae that grows in the briny water. 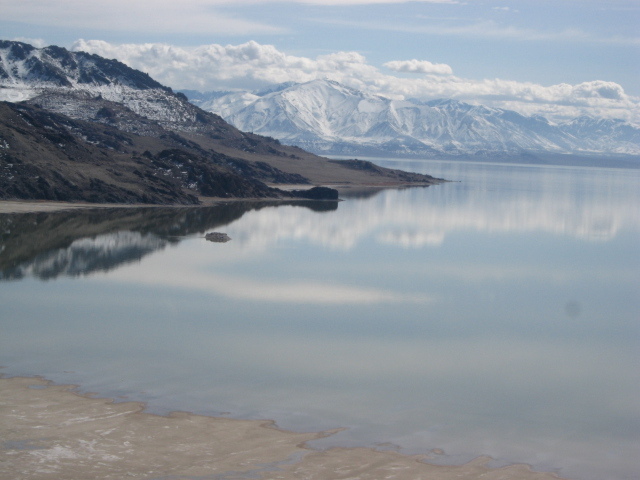 There are no fish in this lake–it’s too salty, but there are brine shrimp, also known as sea monkeys, and sea gulls nest in the area. 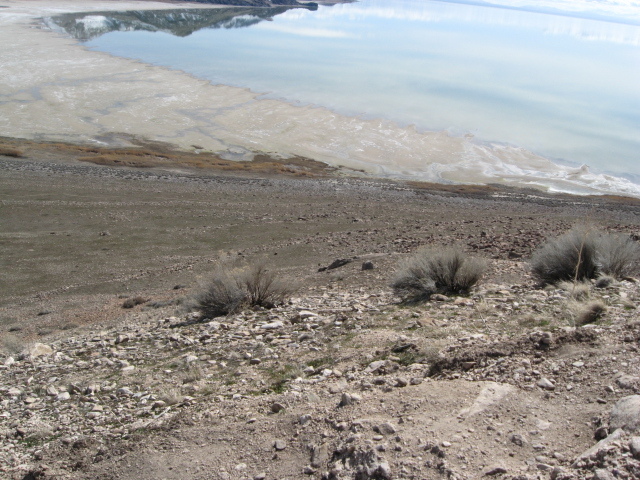 I am looking down an almost sheer cliff at the lake below. 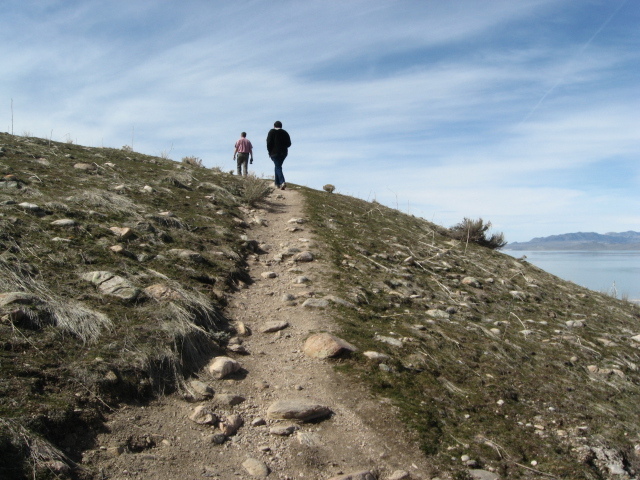 This is the kind of trail where one wrong step means serious injury or death. I was careful. And here’s a picture of me on the island. Ya think I should make it a profile pic? 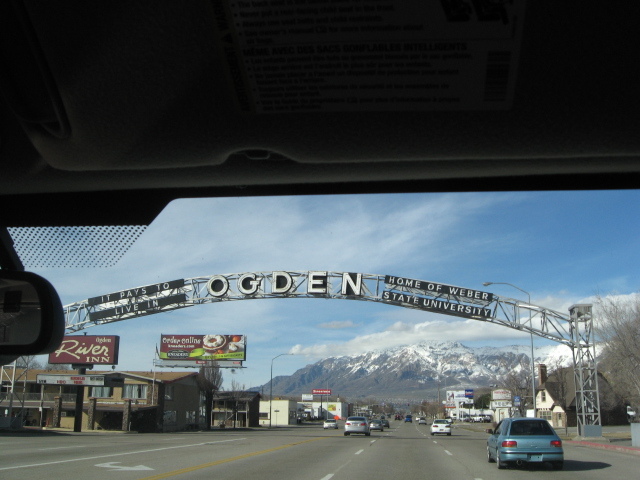 After leaving the island, I had Henry take me further north to Ogden, Utah. 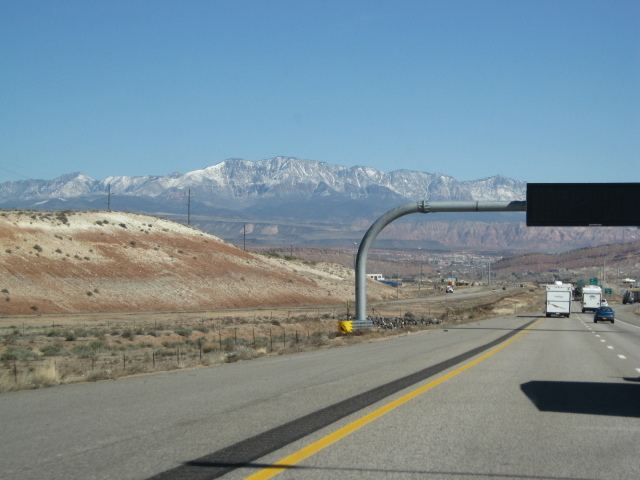 This is the town where I was actually born, and I haven’t been here since I was a baby–totally don’t remember it, and would claim I’ve never seen it before. It was a mixture of old and new, and I kind of liked the looks of it. 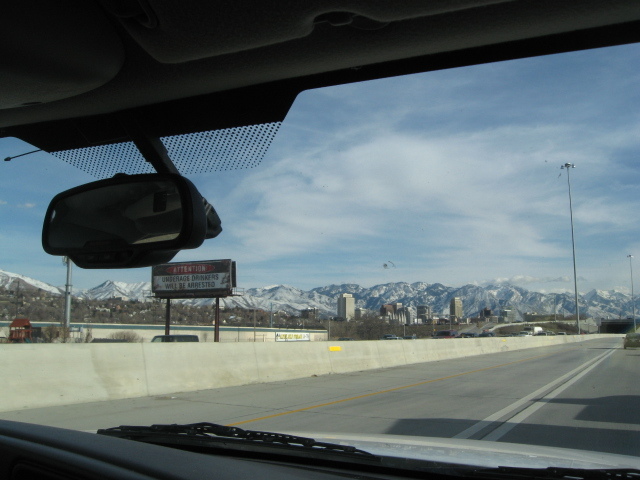 This is the only shot I got of the skyline of Salt Lake City. And this is my niece, Angela St. Andre. 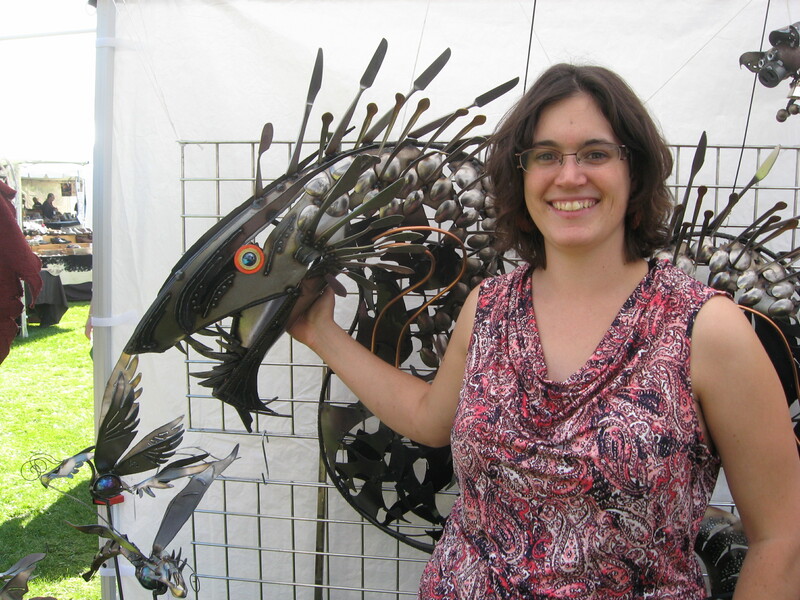 She is a talented artist and metal sculptress. 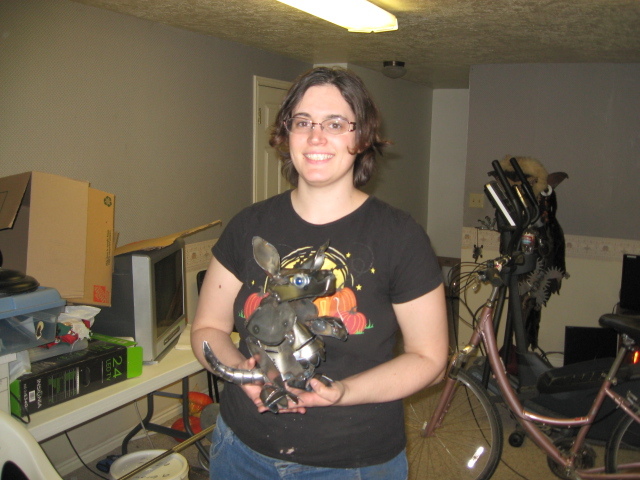 Here she is holding a small metal armadillo that I commissioned her to make for my friend Steve Crompton and his wife. They collect armadillos, and it seemed a great chance to get them a one-of-a-kind original. And with that, my camera memory was full. I couldn’t take any more pictures. 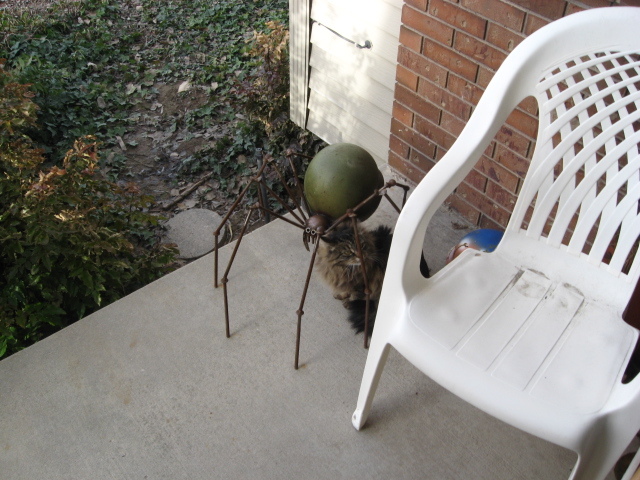 So you don’t get to see the very friendly cat that followed me around and jumped into my lap every chance it got. You don’t get to see me teaching some of Angela’s friends how to play Tunnels and Trolls. You don’t get to see my very handsome nephew Nathan who does nature walk blogs of his own. 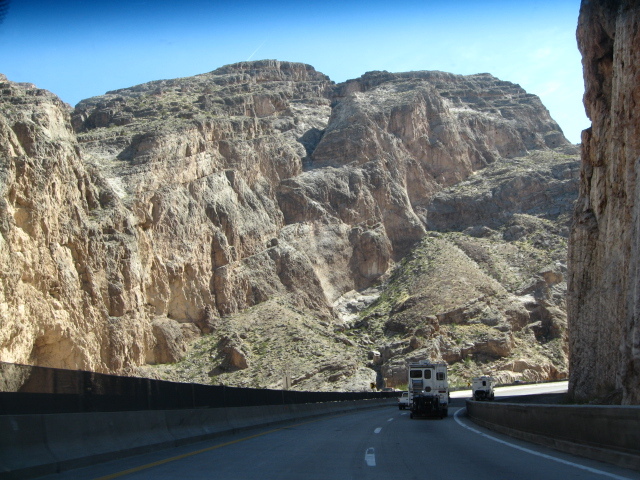 You don’t get to see any of the drive back to Arizona, including the ruggedly beautiful terrain around Page and the Glen Canyon Dam. I could have easily taken another 50 photos on this trip, but the camera filled up, and I had to stop. Lucky you! The trip back to Phoenix took two days, but I got home in time to join the Fellowship of the Troll for supper at the Talking Stick Resort east of Scottsdale. 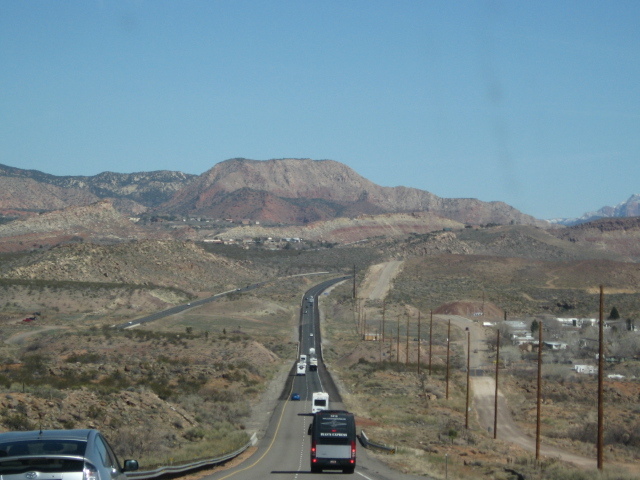 I saw a chunk of the Navajo reservation I’ve never seen before since Highway 89 between Page and Harper’s Ferry at the Vermillion Cliffs was destroyed by a landslide last month and may take years to repair. The only thing that really went wrong for me on the trip was that I accidentally left behind the fantasy paperback I was reading at Henry’s house. I hope Angela or Nathan or Henry discovers it and gets a good read out of it. 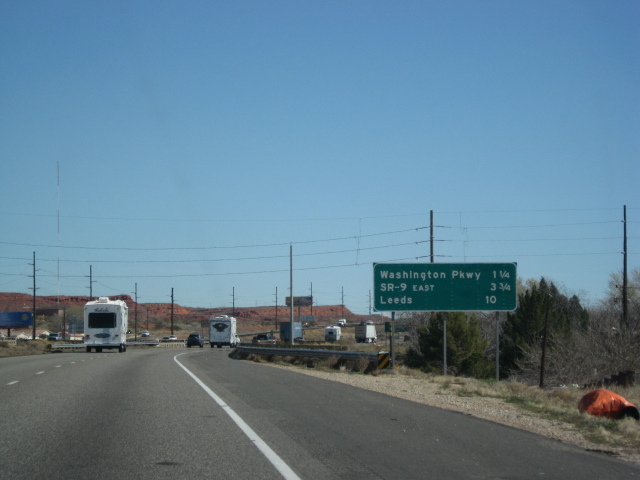 If you have pictures of scenic Page, Arizona, or have visited the Great Salt Lake, or seen the dinosaur tracks in the stone outside of Yoba City, why not leave a comment? 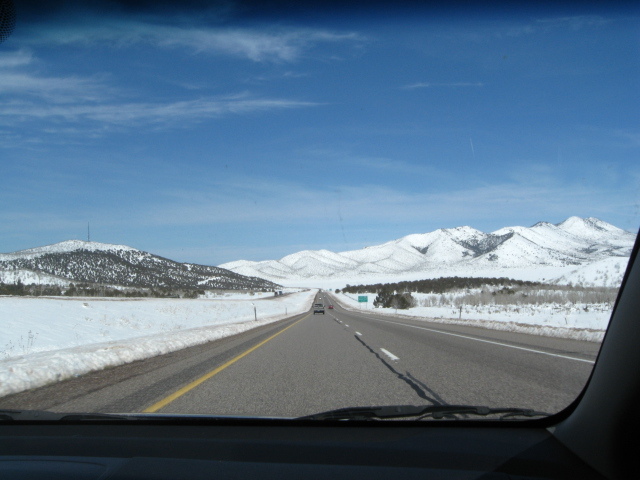 The road trip is over, but perhaps I’ll do it again some day. I began Saturday with the resolve to take more pictures and do a better job of documenting GenCon. It had rained during the night, and we overdressed in the morning because I thought it would be chilly. 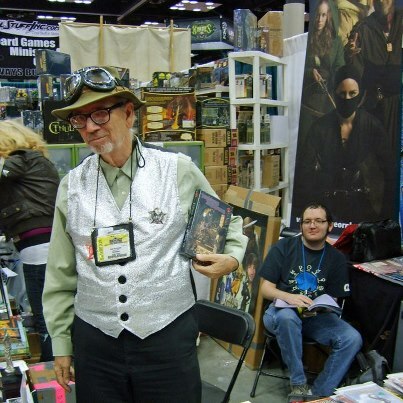 I also put on my minimal steampunk costume–shiny vest, demonic badge, trollgod’s hat with goggles. I looked like this. Ya think the big convention badge kinda ruins the look? But first let’s go back to late Friday afternoon. After walking around the hall for a while, I got back to the Flying Buffalo booth to find this going on. I’m attracted to warrior women. I met this dangerous dame and got her picture. She’s my idea of a living t & t adventuress. 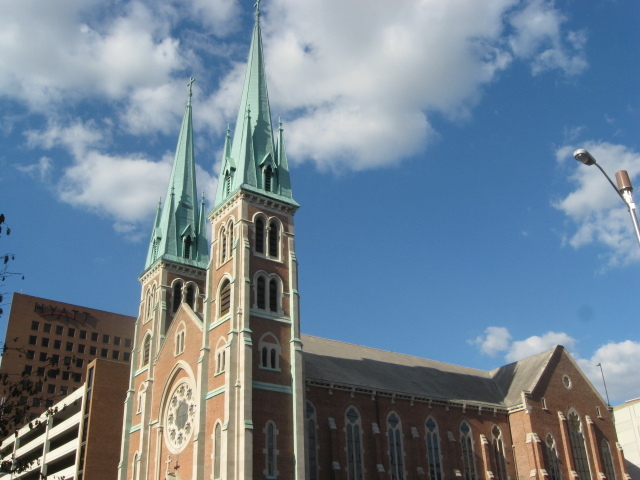 I just love the look of this old Catholic church across the street from the Convention Center. I got this shot as we headed for the car Friday night after the Dealers Room closed. 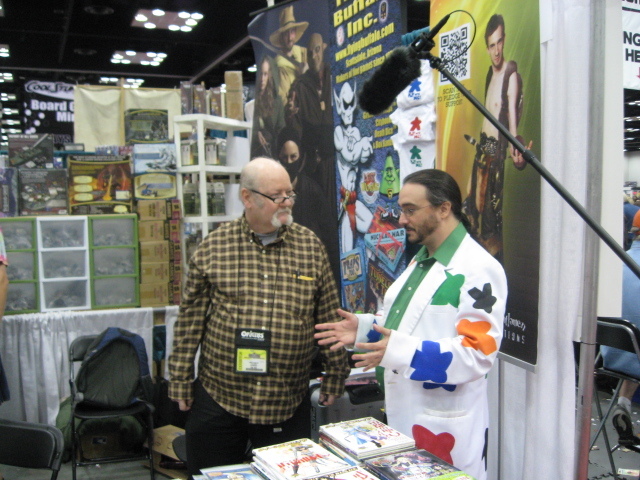 Rick goes to Indiana and GenCon to sell games. Sometimes I think I go with him just to indulge myself at Steak and Shake restaurants. We don’t have them in Arizona. 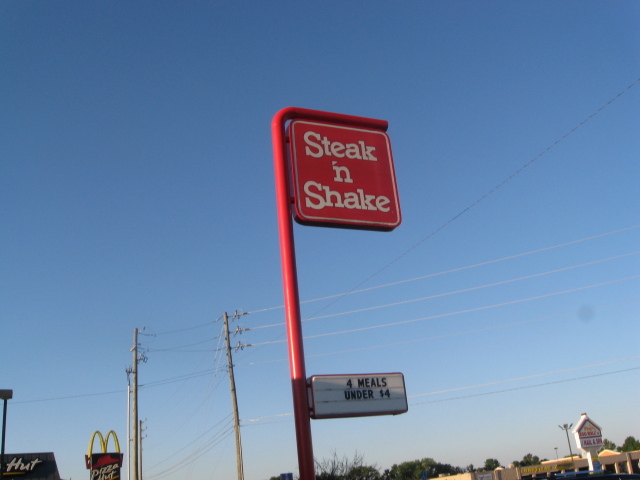 There was a Steak and Shake restaurant right next to the Red Roof Inn where we stayed about ten miles south of downtown Indy. 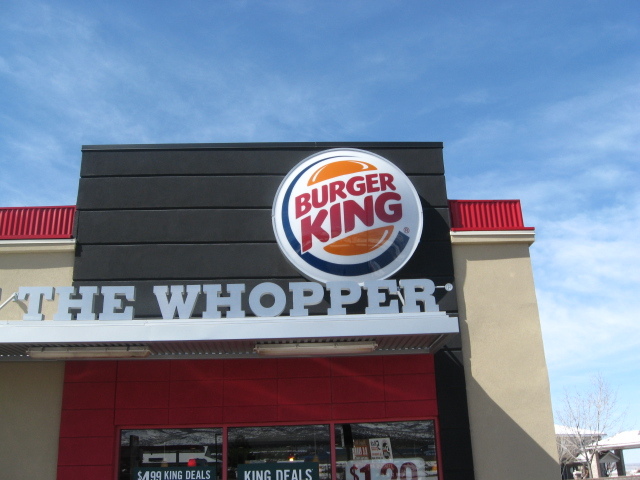 The food is mostly hamburgers, but the variety of shakes is exceptional and they are really good. 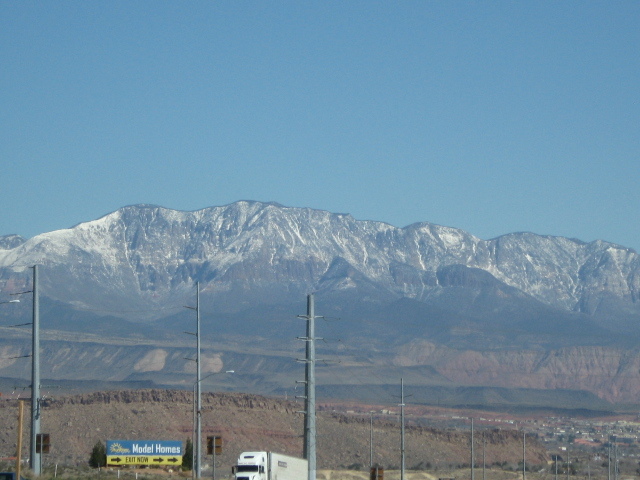 I took this shot Saturday morning on our way into the Convention after breakfast. 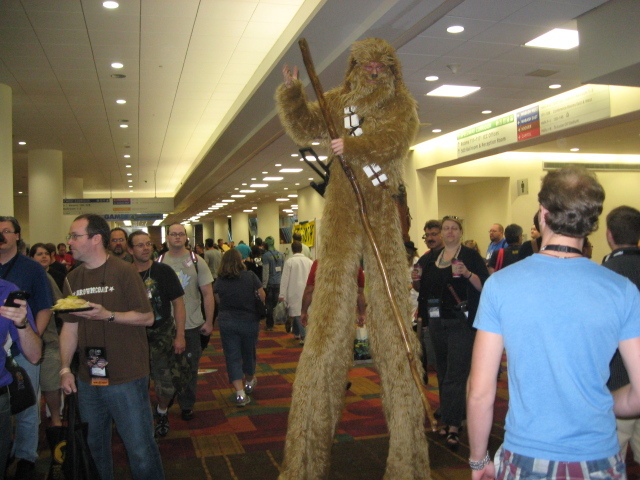 The Wookies get really tall at GenCon. Half a day has gone by and another T & T adventure is behind me. This dragon witch was one of my T & T players. 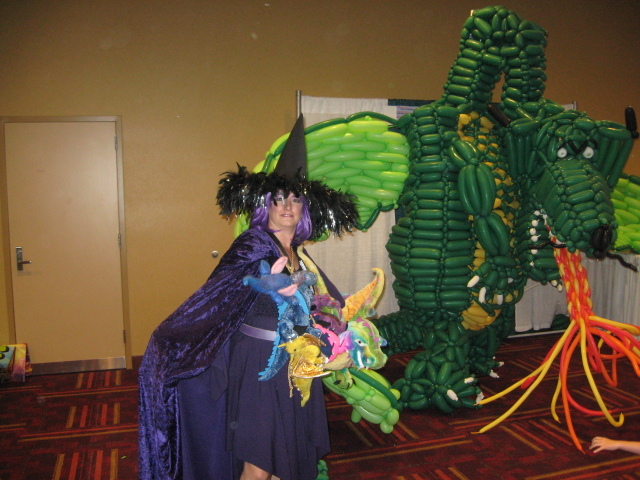 When I saw her again in the convention hallway near the balloon dragon, I got her picture. She was the last survivor of my Seven Challenges adventure on Saturday morning. On Saturday afternoon Rick Loomis did his Nuclear War tournament, in which he had some 48 competitors. 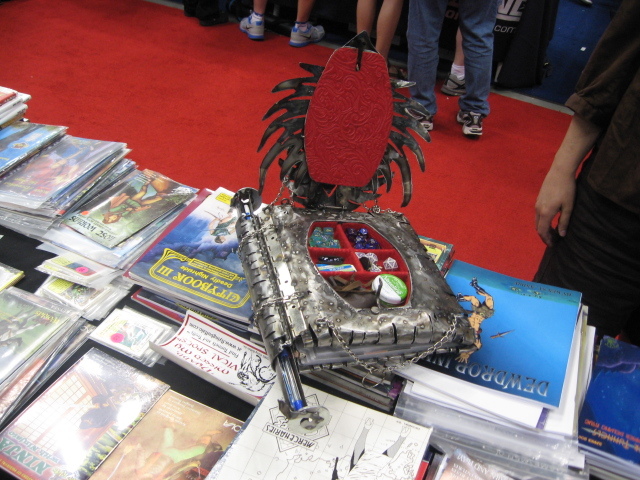 I stayed and watched the Flying Buffalo booth, and sold a ton of stuff. Much to my delight, my most talented niece, Angela St. Andre stopped by to visit me and show me her latest work. She is a sculptress, but she works with welding and cutting tools in metal instead of a hammer and chisel in stone. Look at this beautiful notebook. This awesome gaming notebook with its secret compartment for dice was created by my artistic niece, Angela St. Andre. It weighs about 20 pounds and is made of steel. It is lying in the midst of the Tunnels & Trolls material we were selling, including my largest recent solo: the Dewdrop Inn. 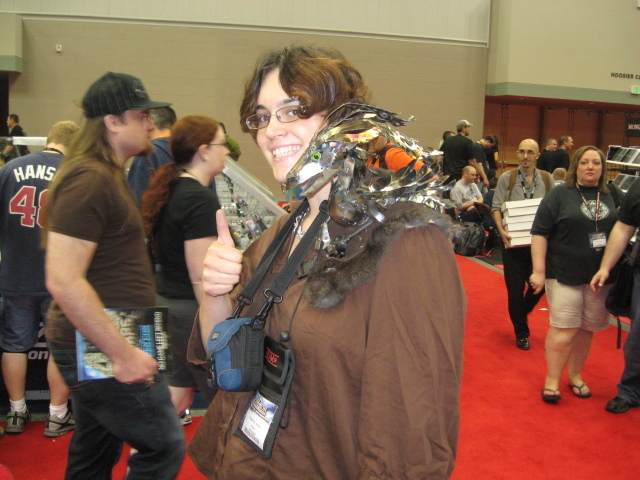 Angela St. Andre and her shoulder dragon. Lots of people were taking her picture. This young woman is seriously talented, and she loves gaming. Here’s Angela with notebook and shoulder dragon. She didn’t buy these artifacts, folks. She made them. 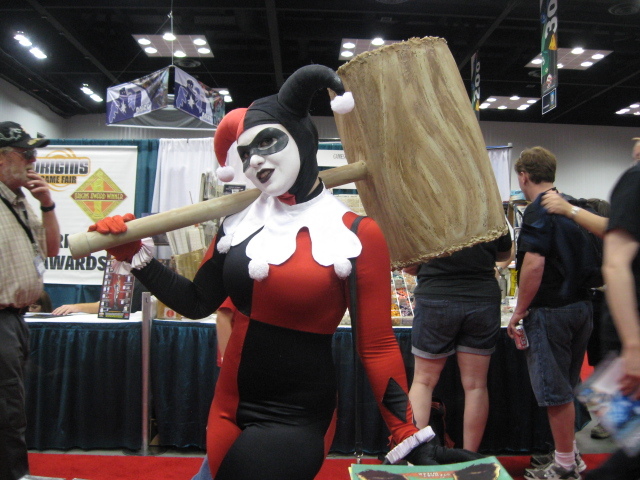 After Angela left, Harley Quinn stopped by to see me. What a babe! Totally wasted on that Joker doofus, imho. Hey Mist-Tikk Foo-all, here’s a troll hammer for you. 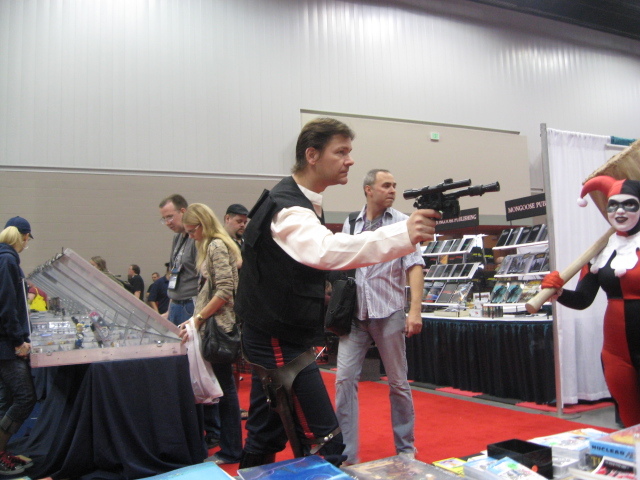 Actually, Han Solo was walking around with Harley Quinn. GenCon is a very strange galaxy. I only have about ten pictures left to go, so let’s stop the tour here. I’m still at the Buffalo booth selling things, but Saturday was a great day for hall costumes. 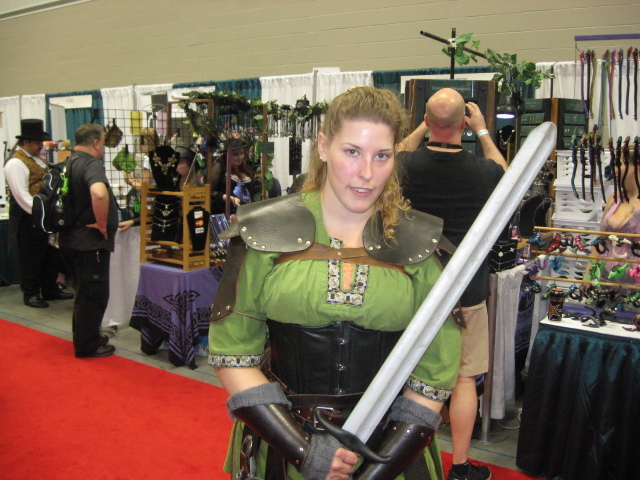 In general, big gaming and sci-fi conventions are great places for cosplay. The regular costume for such meetings is jeans and t-shirt, but the really cool people come in costume. I’m not one of the really cool people, but even I have put together a costume for such occasions–you can see it back at the top of this picture essay. I also bought an elven forester’s costume that I haven’t worn yet, just to have something special for the next masquerade I get to attend.